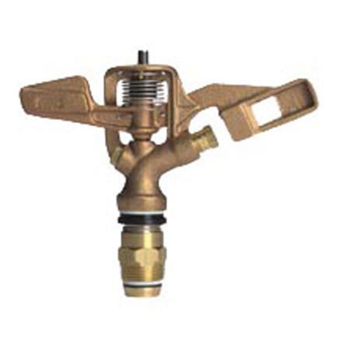 The Storm Manufacturing Full Circle Brass Impact Sprinkler Head features a solid brass construction with stainless steel drive spring for durability. It is designed for agricultural use in center pivots, solid sets, hand lines, wheel lines, side rolls and large area landscape irrigation. This sprinkler head can be used as a single nozzle or dual nozzle with stream straightener standard.